Every Monday (which is today), I’ll post a doll and an outfit or accessories. Each day for the rest of the week, I’ll post another outfit to fit that doll. Most of the time, each week will represent a theme like 1860s children’s clothing, steampunk attire or, as this week, prom night! On Friday, a gallery post of all the paper doll pieces and links to every post will go up, so if you missed one you can pick it up then, plus that day’s outfit. Than, I’ll do it all over again. All righty, so this week’s theme is formals or proms or possibly red carpet, but I confess I was thinking prom when I designed this set of gowns. 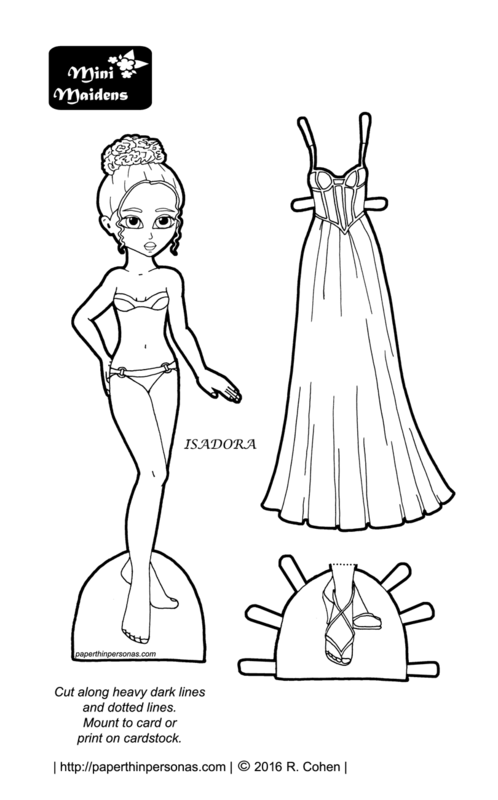 Our model is Isadora, one of the Mini-Maidens. Not for any reason, except she’s got fewer sets than all the other Mini-Maidens. I felt bad for her. What can I say? Her first dress is a floor length number with a boned bodice. She has strappy high heeled shoes and her hair is up in a formal undo. I once had my hair styled like that for a winter formal in high school. It looked pretty wonderful, but it made me almost taller than my date who was 6’2”. Anyway, it gave me a life long love of curly undos. Lastly, if you like PTP and want it to stick around than consider becoming a patron.